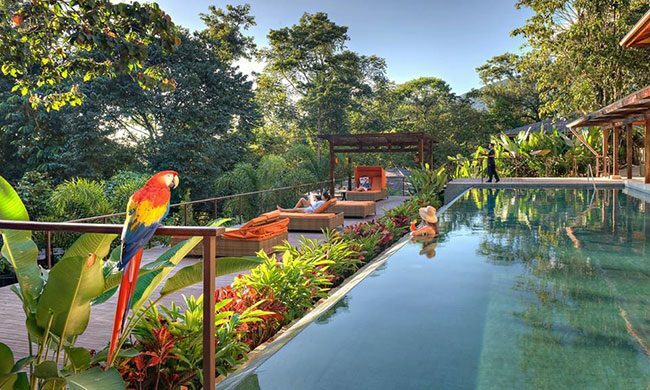 In this exotic luxury honeymoon, spend a week in splendor as you stay in two of Costa Rica’s best hotels: Nayara Springs and the Arenas del Mar. Combine pampering and eco-sustainability, volcanoes and beautiful beaches visiting two of the countries most desirable hotels. Start your exotic luxury honeymoon with a private transfer to the Arenal area, famous for the Arenal Volcano. This region is the adventure capital of Costa Rica. You’ll experience the best it has to offer with an exhilarating canyoneering tour and a combo tour exploring the rainforest via gondola, hanging bridges, and zip lines. Spend the evenings taking in the views of the volcano from your private villa at Nayara Springs Hotel. Your villa features a personal spring-fed plunge pool, outdoor rainforest shower, and elegant amenities. 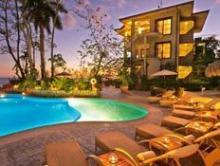 Your next destination will be a pure indulgence, as you enjoy the Arenas del Mar Beach Hotel. A private transfer takes you to Manuel Antonio, where scenic beaches and tropical rainforest await. Relax amidst effortless luxury and lush comfort in a boutique hotel awarded with the highest level certificate of Sustainability in tourism. After 8 days in luxury, return home with memories of relaxation, indulgence, and the beauty of Costa Rica. What’s included in ‘Exotic Luxury Honeymoon’ vacation? 3 nights at Nayara Springs—including a daily breakfast, optionally served in your suite. 4 nights at Arenas del Mar Beach & Nature Resort—including a daily breakfast. All transfers include an English-speaking driver. You will be met at the airport by our team and then your exotic luxury honeymoon begins! You will be taken for a lovely private ride to your first destination, the Arenal Volcano area. Enjoy the countryside and chat with your English-speaking driver about the small towns and landscapes you see along the way. Once you arrive, enjoy a cold drink and a quick check in before heading to your private bungalow. Amenities abound at Nayara Springs. Prepare to be delighted by your outdoor rain shower, private terrace with volcano views, and an intimate plunge pool for just the two of you. Not sure the best way to explore the environment that brings over a million people to this small country every year? This tour may be it! You’ll explore the rainforest in three ways: a gondola ride through the canopy, a walk along hanging bridges in the heart of the forest, and an exhilarating zip line flying across the tops of the trees. After an exciting 4×4 ride, you’ll start a once-in-a-lifetime adventure! Challenge yourselves as you down-climb, river-trace & rappel a series of four waterfalls. The biggest one is 200 feet! 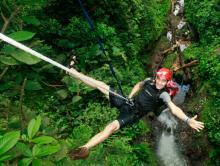 It’s an intense way to see and enjoy the famous Costa Rican rainforest. Enjoy a lovely drive through the heart of Costa Rica as you are transported via private transport from the sultry Caribbean foothills to the stunning vistas and heavenly beaches of the Pacific coast. Here you’ll stay at the Arenas del Mar Beach resort. Arenas del Mar is the ideal choice for anyone looking for sustainable luxury. Dramatic ocean views, two beaches, two swimming pools and a full-service spa make Arenas del Mar the perfect place to relax and enjoy your time at the beach. Spend the morning discovering wildlife on Costa Rica’s most famous national park—Manuel Antonio. Learn everything you want to know about sloths, monkeys, birds or other wildlife that is abundant in this area. Your guide will point out hard-to-spot animals along a well-established trail. Spend your afternoon at the beach within park limits, or return to the hotel for some more pampering and relaxation by the pool. Relax and explore Arenas del Mar. Order lunch and cocktails right from your beach chair or dine under the shade of the covered open-air restaurant. Be sure to enjoy the sunset from the Mirador Bar, and don’t miss happy hour! Head home in your private transport, which will take you to the international airport in San Jose. Go right to the action as you rappel, climb down steep rocky paths, and go river tracing. Each step is more exciting than the one before…all leading to a final rappel down a high tropical waterfall! 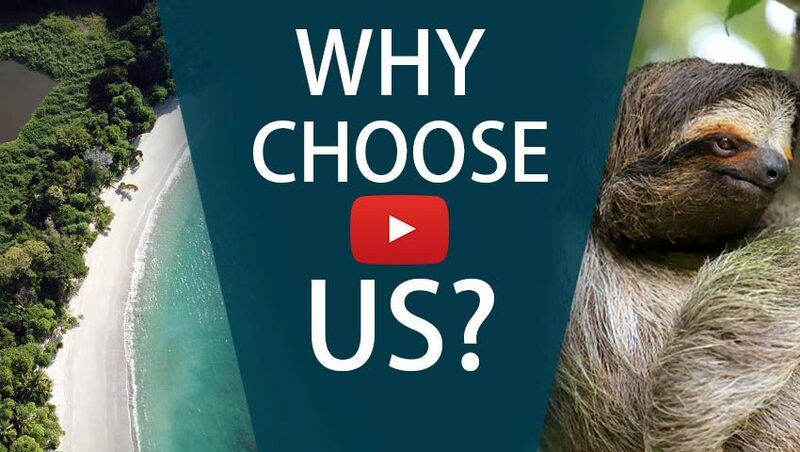 Ideal for anyone wanting to truly experience everything Costa Rica has to offer. You will explore from the Caribbean to the Pacific Coast.